Details have emerged about the middle school teacher in Sparks, Nev. who was shot and killed by a student early Monday morning. Math teacher Michael Lansberry, 45, was a Marine and former member of the Nevada Air National Guard, and authorities believe he died attempting to protect his students. Police, who are investigating the shooting as a homicide, say that the 12-year-old shooter used a semi-automatic handgun to shoot and kill Landsberry. The attacker, who took his own life minutes later, also shot two other students. According to authorities, they are in a stable condition, with non-life threatening injuries. "He pointed to us and he said, 'You ruined my life and now I'm going to ruin yours,'" Alfrancis de Vera, a student at Sparks Middle School told CBS News. The Associated Press is now reporting that the student got the gun from his own home. "I just heard this bang and I thought it was a joke," said student Adam Ramierez. "Then I saw people running." "He was tough, but he had a really soft heart," student Jeremy Hannah, 14, said of Landsberry. "That's why he became a teacher." State and federal authorities have already begun coordinating with more than two dozen school counselors and psychologists in an effort to help students, staff and family members cope with the attack. 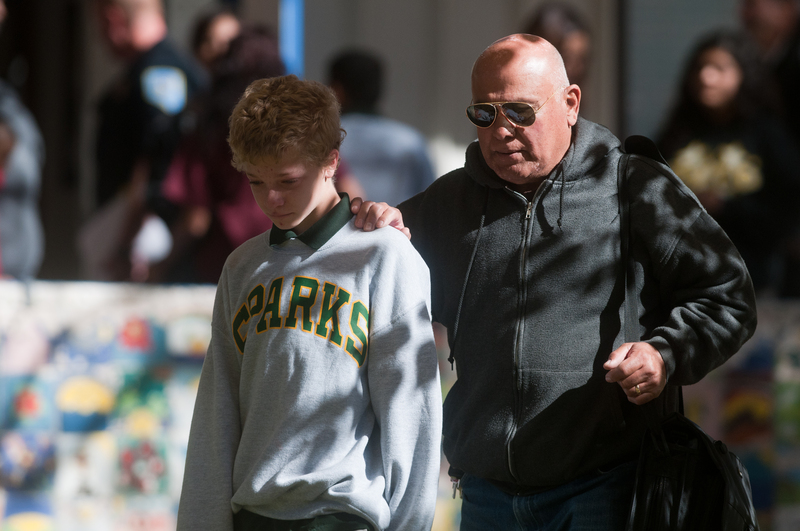 Classes at Sparks have been canceled for the rest of the week, and students at nearby Agnes Risley Elementary were sent home after the shooting. Lansberry had set up a math website for his students. On it, he wrote: "Just like you I have good days and bad days. What may bother me one day may not the next. A very good skill to learn is reading people and their moods. We will learn a lot from each other this year and what bothers us the most. ... One of my goals is to earn your respect while you earn mine." Landsberry served two tours in Afghanistan with the Nevada National Guard, and leaves behind two stepdaughters and his wife.